Wire that is used in a thermocouple from the point of sensing to the point of cold junction compensation (cjc end) where the signal is measured. A thermocouple is a sensor for measuring temperature, that consists of two dissimilar metals that are joined together at the sensing end. Different thermocouple types (e.g. J, K, T, E, etc) use different mixtures of metals in the wire. At the cjc end, the millivolt value provided by the thermocouple represents the difference in temperature of the sensing end as compared to the cjc end (also called the reference end). 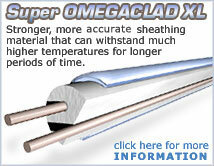 OMEGA Engineering offers a wide range of thermocouple wire in Thailand. How are insulated thermocouple wires identified? The insulation on thermocouple wire is color coded for identification. Common guidelines include that the negative lead in insulated thermocouple wire is red. The positive lead has the color of the thermocouple as well as the overall color of insulated extension grade wire. The outer jacket of thermocouple grade wire is typically brown. For high temperature wire, it is common to have a color coded tracer thread in the white material. For information on usable temperature ranges for the insulation see the "Wire Insulation Identification" table. Other tables at this link are also available for information on the metals used in the thermocouple wire, insulation color codes, and more. What is the difference between Standard and Special Limits of Error (SLE) wire? Standard vs SLE (special limits of error) wire has to do with accuracy of the wire. SLE wire is the same as standard wire with the added feature of having a little better accuracy spec. Accuracy of thermocouples vary with thermocouple types. e.g. For the lower temperature ranges type T, composed of copper wire in the positive lead and constantan (copper-nickel mixture) for the negative, has good accuracy specifications. Additional information on accuracy. What is the difference between Thermocouple grade and Extension grade wire? Thermocouple grade wire is wire that is used to make the sensing point (or probe part) of the thermocouple. Extension grade wire is only used to extend a thermocouple signal from a probe back to the instrument reading the signal. The extension grade wire typically will have a lower ambient temperature limit in which the wire may be used. Namely, it may pass a signal representing a higher temperature as received from the probe, but the wire physically may not be exposed to higher temperatures. Thermocouple wire may be used as extension wire, but extension grade wire may not be used in the sensing point (or probe part) of the thermocouple. Part numbers for extension wire typically begin with an "EX" prefix. What is the maximum length of thermocouple wire? There are many factors that can impact the usable length of a thermocouple. As a guideline, under 100 feet with 20 AWG or thicker wire in an area free of electromagnetic interference usually is fine. Two of the main factors in determining useable thermocouple length are total loop resistance and preventing electrical noise getting into the signal. Because different thermocouple wires are made of different materials, the resistance will vary based on the type as well as the wire diameter and length. The allowable loop resistance is affected by the input resistance of the amplifier circuit to which it is attached. But as a guideline, typically the objective is to keep the total loop resistance under 100 ohms. Loop resistance is determined by multiplying the length in feet by the resistance per double feet (remember 1 foot length of run includes 1 foot from each of the two t/c wires) as shown in "Resistance Vs Wire Diameter" table for thermocouple type and gauge. Remember in your calculations to include the probe (when used/applicable) in addition to the wire length. The second major factor in running a thermocouple wire is to keep it away from any electromagnetic fields. Thermocouple wire creates a low voltage signal and should not be run near power wires, motors, etc. To help minimize noise pickup, a metal over braid or twisted shielded wire is commonly used. Bare Thermocouple Wire is wire without any insulation. Normally it is sold on a spool and ordered as a pair. Usage is typically for making a small thermocouple in applications requiring special considerations. Duplex Insulated Thermocouple Wire is probably the most common type of thermocouple wire. The type of thermocouple, insulation, and size are all some of the parameters considered for the application. Metal Sheathed Thermocouple Wire is thermocouple wire that is surrounded by insulation material, typically magnesium oxide, and enclosed in a metal sheath. A key feature of this type of wire includes the ability to withstand vibration, high temperature and pressure.